"When homosexuals have been given choice and married men and women also given freedom to indulge in adultery, why are Muslims being denied freedom to practice their religion", Asauddin Owaisi said during the meeting. Various Muslim socio-religious and political organisations came together on a common platform in Hyderabad on Friday to demand the withdrawal of the triple talaq ordinance. Muslim groups representing various sects urged the government to ensure that the religious and cultural rights and freedom guaranteed to Muslims by the Constitution are implemented in letter and spirit and not tampered in any manner. A resolution passed at the public meeting organised by the United Muslim Forum (MUF), an umbrella group of different Muslim organisations, condemned the ordinance issued last week, criminalizing triple talaq. It said the piece of legislation was enacted through backdoor. Majlis-e-Ittehadul Muslimeen (MIM) president and Hyderabad MP Asaduddin Owaisi, Jamaat-e-Islami's president of Telangana and Odisha unit Hamid Mohammed Khan, MUF president Raheemuddin Ansari and leaders of various organisations addressed the public meeting at MIM headquarters Darussalam. "The present government seems to be conspiring to take away the religious identity of Muslims. 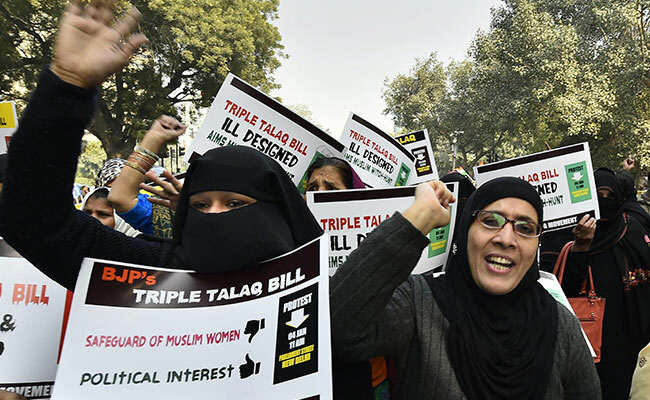 When it failed to get the triple talaq bill passed in the Parliament, the government has chosen to get an ordinance promulgated in an undemocratic manner," the resolution said. A It hoped that better sense would prevail and the government would reconsider its decision. Asauddin Owaisi, in his speech, demanded that Muslims should be allowed to practice their religion since the constitution gave them the right. Referring to Supreme Court judgements on Articles 377 and 497, the MP said Muslims also want to live with freedom to practice their religion. "When homosexuals have been given choice and married men and women also given freedom to indulge in adultery without the fear of being punished by law, why are Muslims being denied freedom to practice their religion", he asked. Mr Owaisi said the Supreme Court in its judgment set aside triple talaq but did not term it unconstitutional. "When the Supreme Court made it clear that if a husband gives triple talaq, marriage will not dissolve then for what crime you are sending him to jail for three years under this ordinance," he asked.